Motorola has officially started rolling out Android 6.0 Marshmallow update for Motorola Moto G 3rd gen 2015. If you own the Moto G3 G-3rd gen here the Guide on how you can upgrade your phone to Android Marshmallow 6.0. Right now the it is available for USA and Canada. While soak test already begun in Brazil and India. 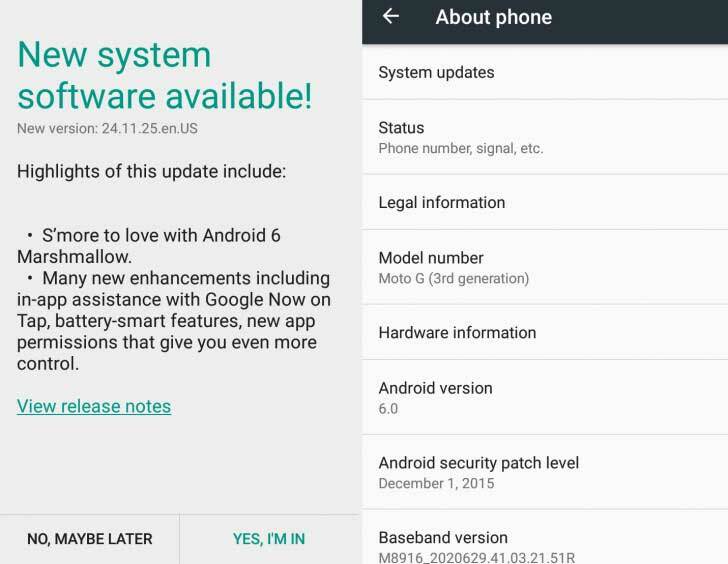 Motorola has released the Android 6.0 (marshmallow) update for Moto X Style and Moto X Play in India. The Android 6.0 Marshmallow update v24.11.25 for Moto G3 2015 is 460MB in size. The update includes security fixes and some enhancements. Very soon the Motorola Moto E2 (E 2nd gen) 4G would also get the update. Make sure you phone is charged and there is stable Internet Cellular or WiFi connection to make the downloading fast. The company has also removed its migrate and Assist Apps in this version.